Over the next year, starting today, we will be migrating all domain registrations under our management to a different domain registrar. For the most part these migrations will take place as the domains are renewed. To be clear about NinerNet‘s position in the domain ecosystem, we are a reseller of domain registrations, reselling domains registered with domain name registrars, who in turn register domains from domain name registries. For the last seventeen years we have been a reseller for OpenSRS, a subsidiary of Tucows; going forward we will be a reseller for RRPproxy, a subsidiary of Key-Systems, a member of the KeyDrive Group. Unless otherwise notified, you will continue to manage your domain registration through the interface at manage.niner.net. Within the next six months the interface at that address will change. We are looking forward to an improved experience for all clients (except those using dot-zm domains, of course) as a result of this move. If you have any questions or concerns, please let us know. As always, if you are concerned about the legitimacy of an email you’ve received that pertains to your domain or hosting account with us, please forward it to us and we will advise you accordingly. Update, 2018-06-29: Please note that, despite our best efforts, the transfer confirmation emails you will receive from our current registrar are sent from two different email addresses not on the niner.net domain: noreply@opensrs.email and transfers@opensrs.org. The inability of OpenSRS to consistently use our domain in messaging over the years (or even just one of their own domains) is a significant symptom of the problems that have led us to make this decision to move. Our apologies for the confusion. Update, 2018-09-25: Links in the “Request for email address validation” emails are now on the niner.net domain. NinerNet‘s offices will be closed from Tuesday 1 August and will re-open on Monday 7 August. Emergency support will continue to be available 24/7, but routine emails and enquiries will be dealt with on Monday 7 August. Thank-you. This is a long post, but certain sections of it might be useful to you. We have been hearing from some clients over the last few months that they are being inundated with spam advertising weight loss drugs, diet pills, etc. ad nauseam. NinerNet does have anti-spam measures on our mail servers — and they stop thousands of messages a day that you never see — but they generally rely on methods of filtering that do not involve what is called “content scanning” — i.e., having a machine essentially read all of your email to see if it mentions topics you don’t want to hear about. They also don’t generally involve blocking email addresses, as spammers almost always send from a different email address every time, so blocking one email address after the fact is pointless. Additionally, what is a clear indicator of spam for one client can be part of a perfectly legitimate email for another client: for example, a medical client might send and receive completely legitimate emails that include the word “diet” or the phrase “weight loss”, and so we can’t filter for those words across the entire server. Even everyday communications can contain these words when one person enquires after another person’s health, even in a business email: “How’s the diet going?”; “Bob has experienced significant weight loss since he got sick last month”; and so on. In other words, if we deleted all messages containing the word “diet”, for example, we’d delete a lot of legitimate email and upset a lot of clients. Then there are spelling mistakes: If we delete email containing the phrase “diet supplement”, we’ll miss the misspelling “diet suplemment”. So what can you do? Potential solutions fall into two categories — prevention and cure — and we all know that an ounce of prevention is worth a pound of cure. We’ll deal with prevention first, but if it’s already too late for you, skip right to the (potential) cures at the end. Don’t put your email address(es) on websites: Spammers use the same techniques as the search engines to index (“scrape”) websites for email addresses. If you put an email address on a website — yours, or a forum that you’re involved in — it is going to be spammed. Instead use a contact form. These are not foolproof either, but they’re better than nothing and you can tweak them over time in response to their misuse. Avoid using certain email addresses: Certain email addresses get more spam than others. These are called RFC 2142 addresses, and they include info@example.com, sales@, etc. These are common addresses that spammers will send email to in the hope that they go to a real person. Instead of info@, consider an alternative like contact@. Avoid common first names: Yes, your name might be Jim and you want to use jim@example.com, but avoid it. If your surname is Smith, try jims@example.com, jsmith@example.com or even jimsmith@example.com instead. Consider adding punctuation — e.g., j.smith@example.com. Domain registrations: Use a dedicated email address for your domain registrations. Over the years most domain registries have been part of the spam problem by publishing email addresses in their “WHOIS” databases, which are scraped the same way websites are. Instead of using your primary address as the public contact for your domain registration, use a secondary one. However, it must work and you should check it regularly — e.g., once a month or so. The registry that NinerNet uses does not publish the billing contact’s email address, making the email address for this contact less likely to receive spam. And while we do provide WHOIS privacy where all of the contact information for your domain registration is hidden, we don’t recommend this for businesses as looking up the WHOIS information for a domain is a legitimate method for your customers to verifying the legitimacy of your business. Use throwaway addresses: If you need to give an email address out in situations where you’re concerned it might be abused by the person or organisation you’re giving it to, create a throwaway address for one-time use. Don’t be part of the problem! : See “How and Why to Blind Copy Multiple-Recipient Emails“. Also, don’t send mass emails yourself to people you assume will be happy to receive them — e.g., customers who once did business with you six years ago! Use an anti-virus scanner: Prevent your computer being taken over by criminals who want to mine it for data, not the least of which are the email addresses of your friends, family and business contacts. In truth, there is no cure. If your email address is on a spammer’s list, it’s going to be sold and traded on. But no matter how well you do on the prevention side, someone else who has your email address on their computer is going to allow a virus in, and your email address will end up on a list. Log into your email account at mail.niner.net. Click “Settings” in the top, right-hand corner. 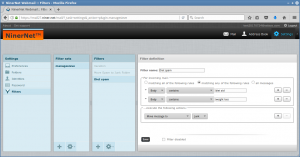 Click “Filters” in the left-hand column under the “Settings” heading. Click the plus sign at the bottom of the third column from the left under the “Filters” heading. In the “Filter name” box, give the filter a name like “Diet spam”. In the “For incoming mail” section you probably want to leave the default “matching any of the following rules” setting in place. In the first drop-down list, select “Body”. In the second drop-down list leave “contains” selected. To add more spammy words or phrases, click the plus sign to the right to add another “rule”. In the “…execute the following actions” section, we recommend you select “Move message to” in the first drop-down list, and “Junk” in the second drop-down list. At the bottom of the page click the “Save” button. 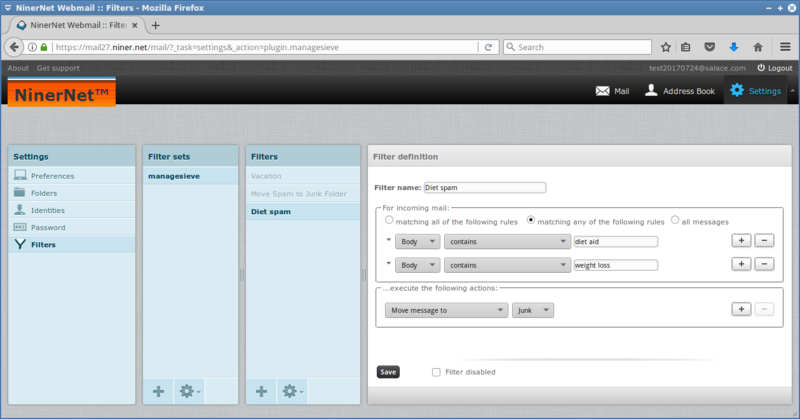 Now emails matching the filter you have created will automatically be filtered to your “junk” folder. We suggest that you check your junk folder regularly for a while after you create a rule to make sure it doesn’t catch any legitimate email. Please note that you use these phrases and instructions for filtering your email at your own risk! We hope this helps you fight some of the spam you’re receiving. If you have any questions, please contact support.